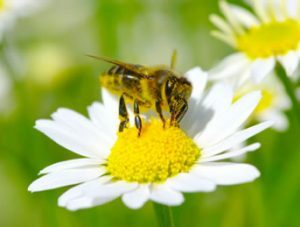 There are over 1,500 species of natives Bees in Australia of which about 10 are social, meaning they have a Queen Bee, workers and drones making up each colony or nest. Bees are important in the plant world and our Food Chain for pollinating plants, orchards, crops and vegetables, in addition to producing honey for the kitchen table. With the on-set of the hot weather, Bees become active collecting pollen and nectar. If you need to get rid of Bees, you need a Pest Controller and we are here to help you with Bee removal, give us a call now. We should all Bee aware of our surroundings, whether you see a single Bee going about its business or a swarm, or hive of Bees, do not approach them. Not only is there a potential for Bee Stings but, there is a serious life threatening medical concern for people who may be allergic to their venom. Only a professional Bee exterminator or Bee removal specialist, such as; Control-A-Pest Pty Ltd, should approach active Bees. A swarm occurs when the old Queen Bee leaves The Hive with around half of the Bees and they hover around an object like a fence or a bush, where they remain until a new home is found by the worker Bees. This could take anything up to a couple of days, when they move to their new site and establish their new hive. During the swarming period Bees are not normally aggressive, unless provoked. 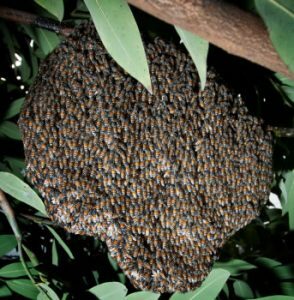 However, the longer they remain in a swarm the more defensive they become and then depending on where they resettle, that location may also produce a problem, which means you will need a professional pest controller, call us here at Control-A-Pest Pty Ltd for advice and Bee removal, contact us now.